Buried at Arlington National Cemetery, Arlington, Virginia, USA. 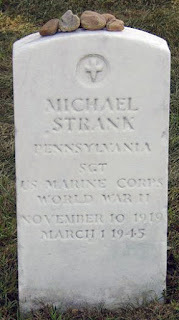 Sergeant Michael Strank (1919-1945) was one of the five Marines and a Navy corpsman who during the battle with the Japanese on February 23, 1945, raised the American flag on the island of Iwo Jima in the Pacific theatre of World War II. The photo of this event, taken by AP photographer Joe Rosenthal, became one of the most recognized images of the 20th century, and in it, Mike stands for the legions of Rusyns who, like him, left their Carpathian Mountain homeland, full of hopes and dreams, to begin a new life in America – the country for which many of them and their children would give the supreme sacrifice. 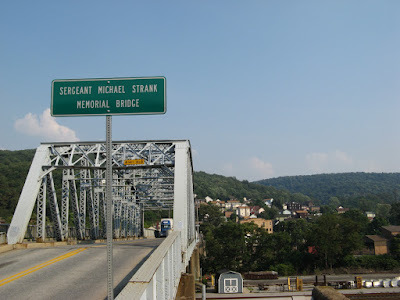 Mike Strank (Mychal Strenk) was born in 1919 in the Rusyn village of Orjabyna [official name: Jarabina] in the heart of the Rusyn-inhabited northern Spiš County in present-day Slovakia. 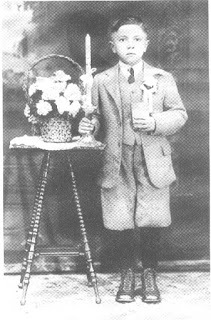 His parents, Vasyl' and Marta (Grofik) Strenk, came to the United States with young Mychal in the early 1920s and settled in Franklin Borough, near Johnstown, Pennsylvania, with many of their fellow villagers from Orjabyna. They attended Holy Trinity Rusyn Greek Catholic Church just across the river in Conemaugh. 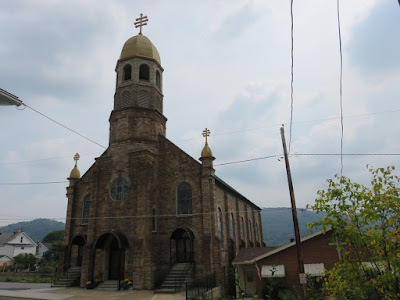 Holy Trinity Greek Catholic Church in Conemaugh, the Strank family's spiritual home in the U.S. The popular book Flags of Our Fathers (Bantam, 2000), by James Bradley with Ron Powers, while incorrectly referring to the Strank family variously as Czech and Slovak, nevertheless provides a revealing portrait of Mike's childhood as he grew up in a Rusyn immigrant family in a Rusyn community. He was the enigma: the immigrant who became the ultimate fighting Yank; the cerebral little boy from the tough mill town who grew up to be the protosergeant; the physical intimidator who turned out to be the tough shepherd of his flock. The "old man" of his company, who would not live to see twenty-five. …[In 1920] Vasil emigrated to America and changed his name to Strank. Sponsored by an uncle, Alex Yarina, he passed through Ells Island and made his way to the Pennsylvania mining and steelworking town of Franklin Borough, on the Conemaugh River sixty-five miles east of Pittsburgh and two miles east of Johnstown. 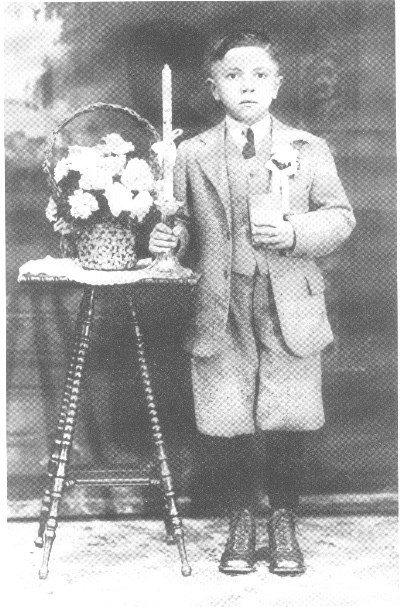 Michael Strank on the day of his First Communion. ...The family lived in a two-room rental apartment inside the Slavic enclave. The rooms were a kitchen and a bedroom. To Martha especially, this was luxury: a castle, she said, compared with what they had endured back in [Orjabyna]. Mike, John, and Pete shared one bed; their parents slept close by in the other. Vasil trudged off to the mine at three p.m. every day in his lamp-hat and fatigues, carrying a pail that had a thermos of water in the bottom and his lunch on top. He wore the same clothes all year round, returning home black with coal dust from head to toe. But proud. This was progress! ...Without realizing it, Vasil Strank might have begun the molding of his eldest son into a Marine’s Marine right in the bosom of his tiny household. Mychal—now renamed Mike – shared a bed with his brothers John and Pete. Returning from his late shift at the mine as he did, at about one in the morning, Vasil seldom saw his three little boys awake – they would leave for school while he was still sleeping, and he would be gone to begin his shift by the time they returned. This routine could not have been easy for Vasil. ...And Vasil abided by a strict Old World value system. Discipline in the fami1y was paramount. When one of the boys had misbehaved, Martha would report it to Vasil upon his return home at night, and he would wake up a few hours later, along with the boys, to administer punishment. Vasil insisted on a special rule for this punishment: No matter which boy had committed the offense, all three would be disciplined equally. In this way, Vasil thought, he could transfer the burden of discipline from himself to the boys; make them see that they had a shared interest in the good behavior of each. Vasil probably did not know that he had intuited one of the fundamental principles of military training; in particular, Marine training. 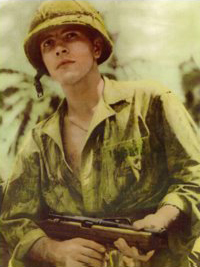 Roughly fifty percent of procedure in a Marine basic-training program is about disconnecting the young American boy from his concept of himself as a unique individual, a lone operator. He is remolded into an integer in a team. Shared responsibility – an abiding sense of the unit – is essential to survival in combat. Thus, if a recruit should faint from exhaustion during a forced march, the rest of his unit is trained to run in circles around his body until he comes to. Equal discipline. …Mike Strank was nineteen now. The year was 1939. In Europe, Hitler's legions were overrunning his Czech homeland, making slaves of his people. Mike decided to join the Marines. He didn't have to do it. He could have avoided military service altogether, given his Czech citizenship. Brother John always puzzled over the fact that the Marines allowed him in at all: Apparently, no one checked out his nationality. Mike enlisted on October 6, 1939. He was the only one of the six flagraisers to sign up before America entered the war. But soon the brainy Czech boy would transform himself into a prototype American fighting man: a tough, driven, and consummate leader, advancing without complaint toward what he came to understand was his certain death. 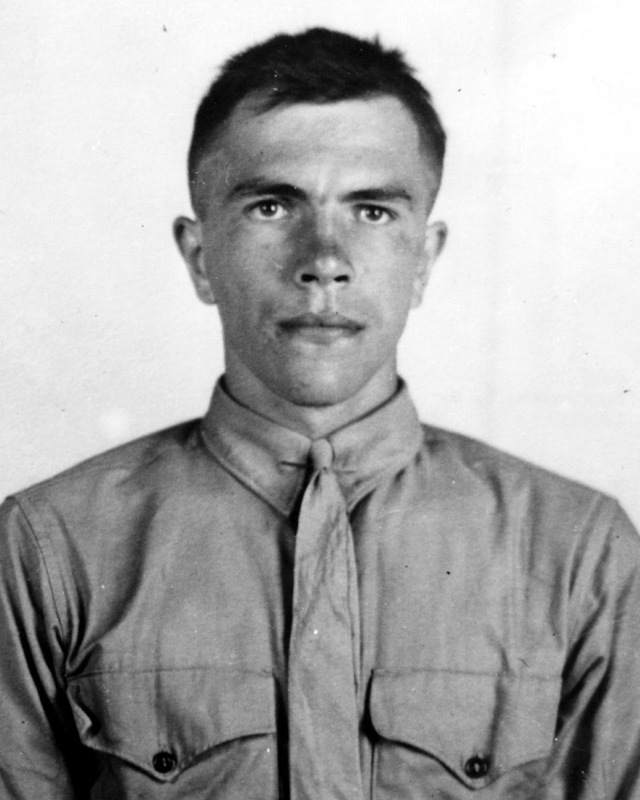 Mike died on Iwo Jima just a week later, March 1, 1945. He was hit by a mortar as he was diagramming a plan in the sand for his boys. His body was buried in Arlington National Cemetery outside Washington, D.C.
Mike and his five fellow flag-raisers are memorialized also at the Iwo Jima Memorial at Arlington, which was dedicated by President Dwight D. Eisenhower on November 10. 1954. It's the world's tallest bronze statue, standing 78 feet high. Flags of Our Fathers spent 46 weeks on the New York Times nonfiction bestseller list, six of those weeks at number one. It was adapted into a 2006 film; Barry Pepper played the role of Mike Strank. Accolades for the book can be summed up with this: "In this unforgettable chronicle of perhaps the most famous moment in American military history, James Bradley has captured the glory, the triumph, the heartbreak, and the legacy of the six men who raised the flag at Iwo Jima." Author James Bradley is the son of John "Doc" Bradley, one of the six flagraisers [ed. : in 2016 now determined to not be the case]; Ron Powers is a Pulitzer Prize-winning journalist. Rusyn Americans take justifiable pride in the fact that one of our own is finally having his story told. 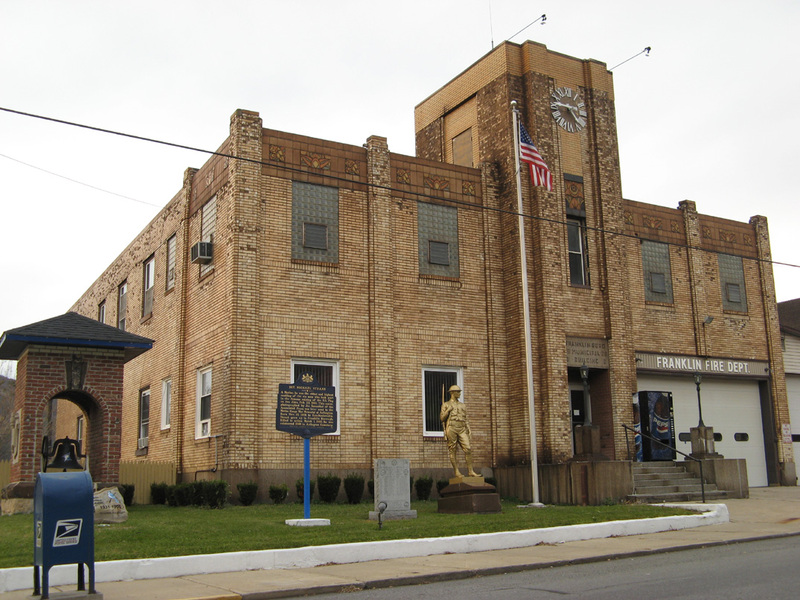 Franklin Fire Dept. 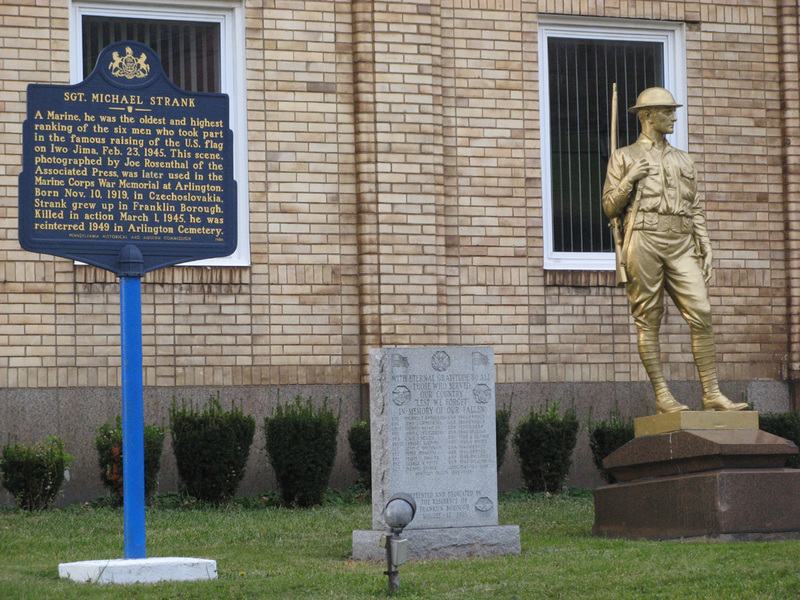 in Franklin Borough, Pa., which memorializes hometown Sgt. Michael Strank. 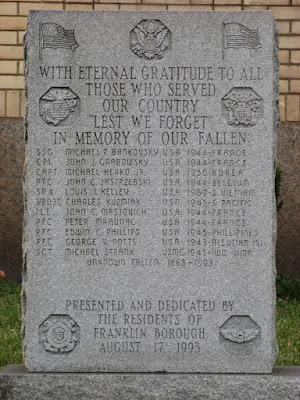 Franklin Veteran's memorial flanked by Strank statue and Pennsylvania Historical & Museum Commission marker. Franklin Borough Veteran's Memorial, dedicated 1993. Rusyn American Michael Strank is accompanied by other Rusyn Americans, Michael Herko, Jr. (+1950) and Charles Kuzmiak (+1945). Sgt. Michael Strank Memorial Bridge [now rebuilt], which carries PA-271 over the Conemaugh River and connects Franklin Borough to East Conemaugh Borough. Was Sgt. Michael Strank a Slovak? The answer to this question can be easily resolved by looking at the census statistics from the 1921 Census of Czechoslovakia, for the Strenks' home village of Jarabina/Orjabyna – around the time the family left, at a time when many other Rusyn villages were succumbing to the trend of Slovakization in their village schools and the nationality they were declaring for themselves on the census. In other words, virtually every Greek Catholic in Orjabyna identified as a Rusyn, not as a Czech/Slovak. 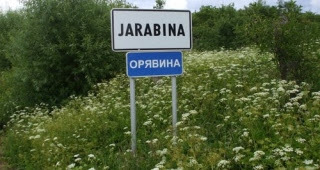 In 1921, despite the trend in some other Rusyn villages, at least 89% of Orjabyna’s residents were Rusyns and identified themselves as such. 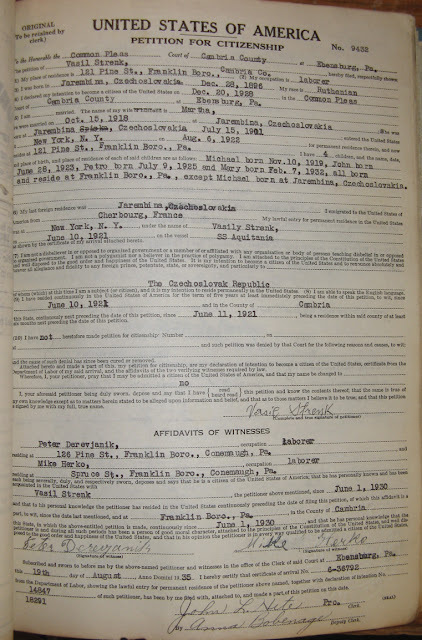 The personal ethnic feeling of Michael's father Vasil Strenk is evidenced by the Petition for Citizenship he filed in Cambria County, Pa., in 1930. Michael's father Vasil Strenk: "My race is Ruthenian"
The Slovak-American community’s styling of Sgt. Michael Strank as a “Slovak American hero” is baseless and unsupported by the facts. Orjabyna then and today is a village of thoroughly Rusyn character, with Rusyn the first language of virtually all its inhabitants, a Rusyn folk ensemble “Poljana,” Greek Catholic and Orthodox churches, and a village school which until recently taught Ukrainian as a second language.